The second quarter of 2018 as expected by various analysts and experts did bring very welcoming days in the crypto-market as almost all coins are in the green on double digit gains. 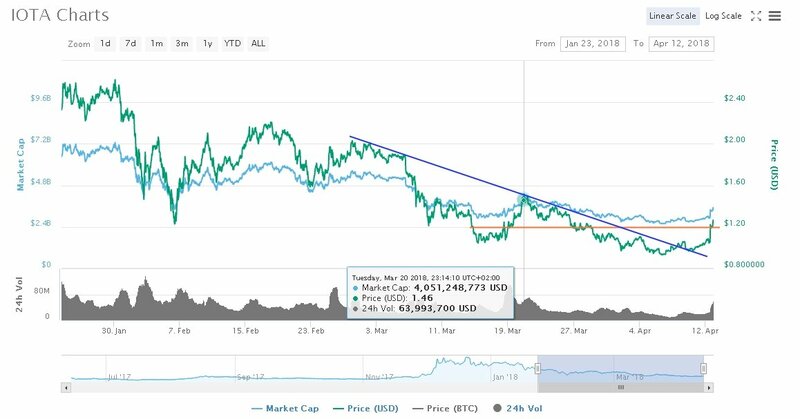 Out of the leading cryptocurrencies standing out strongly are EOS and IOTA as the latter one is on 22.95% increase in the last 24-hours reaching the $1.25 mark. For the time being, the daily declining trend was cleared and the pair MIOTA/USD made it past the major $1.20 again since mid-March. As long as the price stays above the mentioned level, IOTA could test the big $1.50 in the upcoming days if everything moves like the market is doing right now. The IOTA team received a mighty boost as the news of Dr. Rolf Werner, the head of Central Europe business at Fujitsu’s connection with the cryptocurrency surfaced. On joining the IOTA Foundation, Dr. Werner re-emphasized the many possibilities that DLT and Tangle bring to the world. He stated that the use cases of this platform go beyond being used in securing machine-to-machine (M2M) communication and payments. For instance, we could see the use of this technology in supply chain management where it could provide a tamper-proof mechanism to monitor the movement of goods. If you are looking for a well-cemented long term choice, the project that has a crystal clear vision of the future would be wise to go as it will turn out just good. So, cryptocurrencies should not just be cared about their price per unit but more of a solution/product/service that it offers. For starters, IOTA is supported on a platform that flies past the present blockchain technology of other competing coins and their existing issues/problems that they do face. Designed by the well-respected mathematician Serguei Popov – the system Tangle is the introduction of a very unique distributed ledger tech to the community. For the system to function properly, there is no need for miners to complete transactions as the network is planned in that way that every time a new transaction is issued, it is confirmed by the next one as the present one confirms two prior itself being requested. The more users, the better the system-network with no problem of overpopulation. Now you can apply the IOTA technology to the fields of education, health, innovation, and collaboration. All these fields are beginning to diversify into the use of DLT. And it seems that companies, governments, and cities will continue to gravitate towards it.